I'm 1/4 Japanese. I may not look it per se, but the benefits have paid off in the form of medium toned olive skin that tans easily and burns rarely. Schwing! Throughout my entire childhood people marveled at how tan I could get, I myself was amazed as I got older. Being tan or having the ability to get tan was always sort of part of my identity. Yet, as I got older it became a wee bit harder to get as tan as I wanted. Actually, I'm not sure if it became harder or I just wasn't naturally out in the sun as much and was pressed for time. Either way, I decided to pay my first visit to the tanning salon. I signed up for a month of tanning, one month before my senior prom. I loved going each day because it was twenty minutes a day (driving there, tanning, and then driving home) that I got to be completely alone with my thoughts after a day of AP classes and a two hour softball practice. It was therapeutic in it's own way. Prom came and went. I decided not to renew because summer was just around the corner. During the summer I would lay out for an hour or two at a time, usually forgetting to wear sunscreen if it was on my own merit (I cringe now just thinking about that!). Then, I came to college. I got into a sorority and then the weather got cold. My tan was fleeting and everyone around me was seemingly a bronze goddess...in December. How were they doing it? It didn't take me long to find out that they all had tanning memberships to various places around town. I wanted not only my tan back, but what I perceived as a part of my identity. Not to mention, tanning felt like par for the course. It sounds horrible to say 'everyone was doing it,' but everyone was and though nobody ever judged me for not tanning more regularly, I wanted to feel just like everyone else. January of my freshman year of college, I decided to get serious about tanning again. My roommate and I discovered this place called Glo (which I knew many of my sisters went to) was having a special for college students. You could get a whole semester of tanning for $100 + the purchase of your choice of lotion (from a sample size packet to a full bottle). If you don't know anything about tanning or tanning prices, then know this, that is a great deal for nearly five months of daily tanning. I had enough Christmas money left over to cover the cost and my roommate and I were quickly tanning almost everyday during the spring semester. I quickly remembered how relaxing tanning is. After a day of stressing out about school, sorority commitments, projects or money, my roommate and I would forgo homework for another hour go tan and get a Sonic drink. It was ritualistic. My sophomore year of college I moved into an apartment complex that offered free tanning to it's residents. It was definitely a huge perk of living there. During the fall, I tanned sporadically - usually not being able to find the time or muster up the will power to walk down to the club house to go tan. However, as spring arrived, so did my urge to tan. Formals were coming up and so was Spring Break and I was paler than ever after a long winter. Everyone started to tan again, including my close friends. I started going almost daily again to try and keep up - not mention get that lovely dose of relaxation I was so desperately fond of. I don't live under a rock. I know tanning isn't exactly good for you. I've read every magazine article out there about safe sun, SPF, and all the facts regarding skin cancer. I read every horror story and heard every argument out there for and against tanning. My deal was, I just didn't care. I rarely burned (like I think I've had 2-3 serious sun burns in my whole life - please someone don't hit me with that fact that only one burn increases your chances of skin cancer by (insert # here)% - I know) and I thought that if I wasn't tanning year 'round then it wasn't like I was doing that much damage, right (I know, probably wrong)? I thought people/magazines/the media were pushing the issue far too hard and it actually turned me off from the matter. However, during my sophomore year and here recently, I got really into preventative skin care. I started using anti-aging products and really getting my skin in order. I started actually taking really good care of it for the first time ever and got most of my troublesome skin woes cleared up. Then, I started a regiment of anti-aging products. It was then that I remembered being bothered. I was going to such great lengths to take care of my skin - to help it keep looking youthful and now all I could think about was me destroying that hard work every time I got in a tanning booth. It made me more mindful, certainly and I started to wean myself off of the booth. I like to think with age comes wisdom and I've recently started to wisen up about my skincare and about what this means when I set foot in the sun. I used to forgo SPF and lather on copious amounts of tanning oil because I was afraid with the SPF I wouldn't get the tan I so desired. It didn't make sense for me to lather on the SPF to get in a tanning booth - that would be counterproductive, wouldn't it? Now, I can't recommend enough SPF. I try to wear sunscreen every day. Whenever I lay or go to the pool I make sure I apply and reapply (at least an SPF 30 or higher). So what does this mean? Even though I've been out in the sun this summer, I've been much smarter about it. Having Jack around has helped too. He's got such sensitive four year old skin and my goal for him is to never have to burn on my watch. It's made me see the level of protection I also need to put into practice in regards to myself. Have I had to sacrifice the tan I want? Yeah, a little bit. I'm nowhere near as dark as I usually get and my face is noticeably paler than previous summers (because it's usually a small space that is prone to burn and tan so I made sure that wouldn't happen this summer by making sure my face was protected with a capital 'P'). 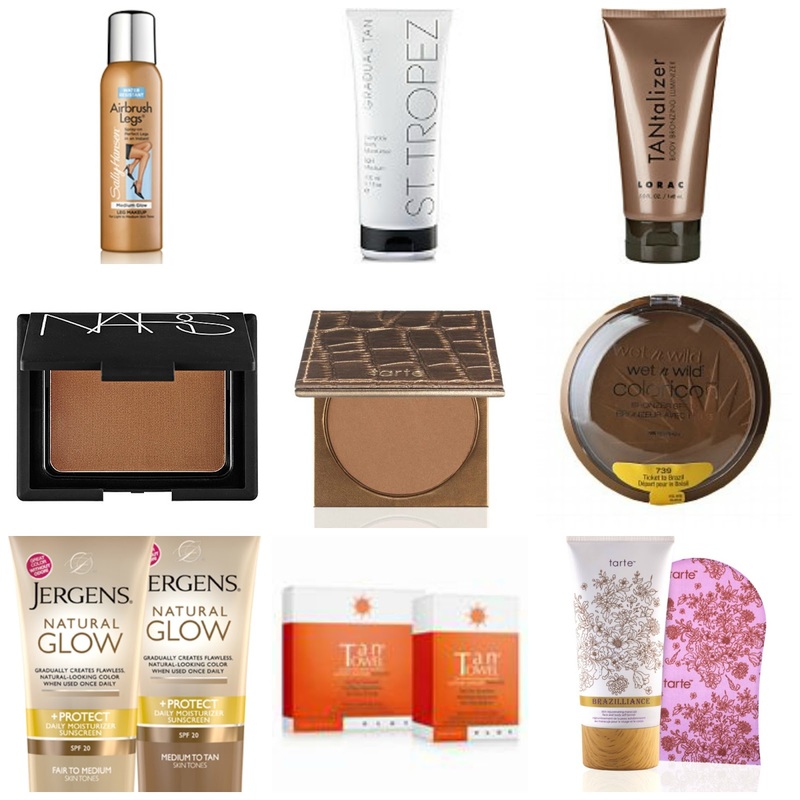 This has led me to accepting a little help from various bronzing and faux glow products. I used to think it was cheating, but now I realize it's the best option for my skin. I was blessed with medium-olive skin with a propensity to tan and I don't want to ruin it. Though I may not be off the tanning salon forever (I am human and it is tempting), I will be much smarter about my skin. I will embrace SPF. I will embrace help from a little faux glow and most importantly, I will love my skin - tan or not because accepting myself and my body is what it's all about. Period. .001 - Sally Hansen Air Brush Legs - this is seriously a gem! Though it doesn't offer long lasting results (think two days on average for me), it's absolutely awesome and has lasted me much longer than anticipated. It makes your legs look bronze and flawless and only comes off only with soap and water. It's perfect for special events or if you just want a little pick me up. Helps to add color and hide any imperfections. It now comes in a lotion, which I'm excited to try after my spray can runs out! Takes a time or two of practice to master, but is worth it and every application just gets better from there on out. .002 - St. Tropez Gradual Tan Everyday Body Moisturizer - I've never tried it, but I've heard AMAZING things not only from people I know, but from almost every magazine I've read who had any sort of article about self tanners. Their Self Tan Brozing Mousse also has great reviews! Has anyone tried this? .003 - Lorac TANtilizer Body Bronzing Luminizer - I got a sample size of this to try (which has lasted me longer than I expected as well), and have mixed feelings about the product. It smells really great and you can quickly see results. However, it sometimes has the tendency to turn almost brick red in places that haven't been rubbed in just right and can be streaky if not applied precisely. If use it, I keep it to simple - hard to mess up areas like my arms. Definitely worth picking up a sample and seeing if it's right for you! .004 - Nars Bronzer in Laguna - This is a cult favorite. I've sampled it, but didn't buy because at the time I still had a full palette of Tarte Bronzer. However, I'd happily recommend any of the Nars bronzers! .005 - Tarte Bronzer in Park Ave Princess - Tarte is one of my favorite brands and this is my favorite bronzer in the history of the world. It's a must buy for me. It's build-able and is perfect for contouring or achieving a nice all-over glow. .006 - Wet n Wild Bronzer in Ticket to Brazil (SPF 15) - I decided to buy this after hearing good things about some of the new Wet n Wild products, specifically the bronzers. The pan is huge and only about $3. I didn't think there was any harm in trying it out just to see what all the hype is about. I've tried it and I like it so far. One sweep around the pan is more than enough. I haven't had much success with it for contouring purposes (bummer), but for an all-over glow it's pretty perfect! .007 - Jergens Natural Glow Gradual Tan Everyday Moisturizer (SPF 30) - I just started using this and am happy with the results so far. It definitely makes me more 'golden' than 'bronze,' but at least I can see the gradual shift in color. The odor that used be associated with this product is gone and it smells quite nice now (to me at least). This is a great starter product because it can be used daily, builds gradually (read - hard to mess up), and has SPF 30! Total win. .008 - Tan Towel - I've heard excellent things about Tan Towel. Basically, it's five large towelettes concentrated with self tanner. Reviewers say it's easy to apply and almost always allows for perfect application. Results show in 2-4 hours and can progressively darker with each new application. If this is the lazy girl's guide to all-over self tanning, the you should probably count me in. .009 - Brazilliance™ Skin Rejuvenating Maracuja Face and Body Self Tanner w/ Mitt - If I had to pick a product I haven't tried, but am most eager too it'd probably be this one! The bottle size is large (meaning a generous amount) and apparently the smell is awesome! It has amazing reviews and since Tarte is one my favorite beauty brands already I'm sure it's worth trying out. Plus, it comes with an applicator mitt! Awesome! I'd love to hear y'all's thoughts on the matter of tanning! Do you tan easily or do you burn? Do you swear by the tanning salon or do you have a faux glow favorite (please share!)? Let me know!